Family relationships are under pressure because of homelessness, uncertainty about immigration status, concerns about the protection of children, unemployment, and ill health. This is according to Bishop Kevin Doran, Bishop of Elphin, who gave the homily at the Mass at the Winter 2018 General Meeting of the Bishops. He referred to discussion during the last year that included the insights of Amoris Laetitia and conversations in parishes and dioceses in preparation for the World Meeting of Families (WMOF) and the Papal visit. Through the Bishops’ Conference and the Council for Marriage and the Family, ideas from discussions were drawn together with the intention of preparing a coherent “vision for the family”, to shape what Bishop Doran called a “response as people of faith and as citizens to the diverse needs and challenges experienced by families in Ireland today”. This led to the publication of A Word of Truth and Hope, which was designed by Veritas. It is aimed at helping clergy, teachers, pastoral groups and those involved in the formation of public policy. He said it includes a range of topics that affect families in all communities and he hoped it would inspire a concrete response. During his homily, he quoted French philosopher Emmanuel Mounier, who stated that a community is only authentic and life-giving when the value of the person is respected and promoted. A community limited to needs and interests bears the seeds of discord. “When we see other people primarily in terms of what they can do for us, then the very basis of community is undermined,” stated Bishop Doran. The Mass at Saint Mary’s Oratory, Saint Patrick’s College, Maynooth, was concelebrated by members of the Bishops’ Conference and clergy. In attendance were members of the Council for Marriage and the Family and staff of the Bishops’ Conference. He concluded by praying that the Church “may find it possible to be an agent in bringing God’s promise to fulfilment for families in Ireland”. The formal launch of A Word of Truth and Hope took place following the Mass on Tuesday 4 December. 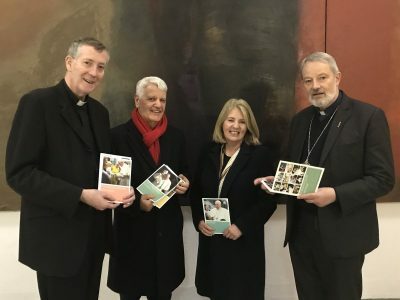 During their Winter 2018 General Meeting in Saint Patrick’s College, Maynooth, the Bishops welcomed the publication and stated that the vocation of the sacrament of marriage and family life enriches the life of the Church and the whole world.